A hooded clock is the name we give to a certain type of hanging wall clock, which looks rather like a longcase clock without its trunk section - in other words looks like the hood of a longcase clock. They seem to have been made for two reasons, firstly as a much cheaper form than the longcase clock, but secondly as a simple hanging alarm clock, for the great majority do have alarms and have no strikework. At the time of their making they were called wall clocks or hanging clocks, qualified with or without the term 'alarm', or even just alarm clocks. They are almost invariably of thirty-hour duration, or occasionally less. I have only come across one eight-day example. Sometimes we see a thirty-hour longcase which has lost its case and has been re-housed in a modern hanging hood of this type, masquerading as a hooded clock. They are not easily confused however as such a longcase made into a 'hoody' will have a dial ten inches square or more and a hooded clock is almost always less than ten inches. I have even seen caseless eight-day longcase clocks hung in a later wall hood in this way. Hooded clock dials can vary from as little as four inches wide to about nine inches, typical sizes being six or seven inches wide. The great majority are square dials but arched dials are known, especially in later examples with painted dials. Verge pendulum examples do exist but the majority have anchor escapement and long pendulum, even though many are single-handers. This is because by the time most of these clocks were made the anchor escapement was long established as a precision timekeeper. Very occasionally we see a sophisticated example. But the great majority were made as simple country clocks, cased in oak or pine, as their whole purpose was to keep the price low enough to come within the purchasing power of an everyday home. Some simple hoods have no opening glass door, but just leave the dial itself open to the elements. They were almost always made with alarmwork and their purpose was presumably to waken early-starting workers on dark winter mornings - not many needed an alarm clock in summer when it is daylight by five a.m. Their function as alarm clocks became the cause of their destruction, because the arrival in the nineteenth century of the efficient and cheap spring-driven Smith's bedside alarm clock meant that many were thrown away as obsolete. So what was once a very common type of clock is now quite a scarce item to find and therefore much enjoyed by clock collectors. Strictly speaking we would today call such an alarm clock an 'alarm timepiece' to indicate that it is not a striker. Alarm examples did not usually strike, as hourly striking near the bedroom would have been counter productive. 1. An oak-cased hooded alarm timepiece made in the 1760s by George Wood of Nailsworth in Gloucestershire. The style is like that of a miniature longcase hood of the day. Click for closer view. We know these clocks were cheap when they were first made, though examples of contemporary prices of any clocks are always hard to find. The late C. F. C. Beeson in his 1962 book 'Clockmaking in Oxfordshire' quotes an amusing correspondence of 1735 between a dissatisfied customer and beleaguered clockmaker, William Ball of Bicester. The complainant says ' When you was here ye 17th of Jan last you promised mee to bring me an Allarum of a guinea price (a guinea was one pound one shilling, today one pound and five pence) in a month or six weeks time & to take ye Clock Allarum agen and give me a guinea and an half in money (one pound eleven shillings and six pence, or in today's coin one pound fifty seven and a half pence)'. What he refers to as a 'Clock Allarum' must have been a striking clock with alarmwork and the plain 'allarum' was a non-striker. In other words the plan was to take a non-striking alarm and a partial refund in exchange for the faulty striking alarm clock he was dissatisfied with. The original prices then must have been £2.12s.6d (today £2. 62 ½ p) for the striking alarm clock, and £1.1s.0d (today £1.05) for the non-striker. At that sort of very low price the clockmaker had a chance that working men could afford to buy his alarm clocks. This very low price explains the simple crudity of some of the case housings. Most hoods are made of oak, but a few pine ones survive, probably because the pine examples were once, or still are, painted. Pine furniture was never originally sold naked, as what we call stripped pine today. Occasionally we see walnut ones and just now and then mahogany. Just how cheap these clocks were can be judged when we compare with original longcase clock prices. These are exceptionally hard to track down, but over the years I have gathered a few together. Many years ago I searched the notebooks of Samuel Roberts of Llanfair Caereinion in Wales, from which I concluded that he priced his clocks without cases - he could supply the case as an extra or the customer could arrange for his own to be made. His basic thirty-hour single-handed longcase clock (without case) sold for £2.2s.0d (today £2.10p), a basic two-hander for £2.9s.0d (today £2.45p). That is as cheap as it ever was. The closest I found to that was a clock by William Roberts of Otley, Yorkshire, (no relation), which had the original receipt pasted inside the door, reading: 'This clock was settlyd the 7th October 1758. Prise £2.3s.6d (£2.17 ½ p)'. For a basic pine case we could add 10 shillings (50p), for a basic oak case one pound. These rural clockmakers were forced to sell for as low a price as they possibly could. That would make the cheapest longcase clock in a case that money could buy at between £2.10s.0d (£2.50p) and £3.00. and puts into perspective how very cheap such hooded alarm clocks were. In his 1984 book 'Gloucestershire Clock and Watch Makers', the late Graham Dowler has a note about a clockmaker of the 1790s from Wootton under Edge with the unforgettable name of Fuber Combe Gerrans, about whose clocks was written much later: 'The majority are cheap but nice thirty-hour bracket alarm clocks for the mill workers....'. He probably means hooded clocks but it is possible he may have been referring to alarm clocks that sat on a wall shelf, though, if so, we seem not to see that type today. Oddly enough I have come across such clocks by a couple of maker who worked at Wotton, though not Gerrans. The hooded wall clock was one step up from that type of clock which hangs directly from the wall and which we today call a hook and spike clock. That was in effect a much cheaper wall clock than the traditional lantern clock with its very high content of expensive brass, and was aimed at less affluent households. It was always a struggle for a clockmaker to supply clients from poor backgrounds such as rural farmworkers, who formed the bulk of the countryside population. 2. 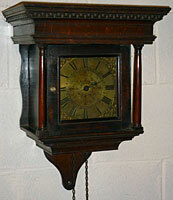 This hooded clock by Richard Stephens of Bridgenorth has a single sheet brass dial and dates from about 1760. The oak hood is very much like that of a longcase clock. Click for closer view. Hooded clocks seem to have been much more common in the South of England, especially the south west. We very rarely see such clocks from northern counties. These clocks continued to be made into the painted dial period, and painted dial examples are sometimes seen dating from as late as the 1830s. We virtually never see eight-day examples. This is not only because an eight-day would have been costly, thereby defeating the purpose of such clocks to appear to the less well-to-do, but also because they would have needed two twelve-pound weights, which would have been excessive for hanging on a hook on the wall. The movement of the George Wood clock shows a typical arrangement with alarmwork at one side. Oddly enough the Richard Stephens clock was made originally with alarmwork but this was removed and a striking train added instead, to make it into a striking wall clock. Here is an unusual example of an owner who wanted to preserve his clock as a useful timekeeper after his need for an alarm clock had passed - perhaps after he retired from an early morning working life.